It was a banner night for the Ripley Wolves and their organization. 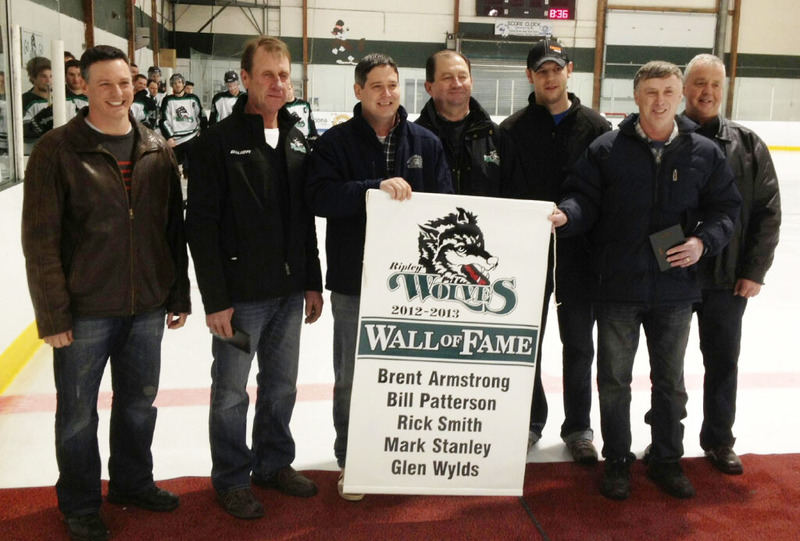 Before handing Shelburne a 7-3 loss, the Wolves inducted the first members of its Wall of Fame, as part of the team’s 10th anniversary celebrations. Brent Armstrong, Bill Patterson, Mark Stanley, Rick Smith and Glen Wylds were cheered during a pre-game ceremony for their contributions to the organization prior to the team’s folding in the late-90s and during its successful, but sometimes difficult, resurrection in 2002. To see just what these gentlemen have meant to the Wolves, read this. The ceremony must have fired the current team up, because only 15 seconds into the game – on a powerplay – Chad Colling had his first of the season, from Jeremy McQuillin and Travis VanGaver. Kyle Wreford made it 2-0 Wolves 15 minutes later on a pretty set-up from Nathan Gavey, who was the recipient of Devin Kemp’s hard work in the corner. Although Shelburne made it a 2-1 game before the period was out, Kurt Edwards was very strong in the Wolves net, turning shot after shot away, on his way to making 38 saves on the night. The Muskies tied it in the second on the most exciting play in hockey – a penalty shot. Minutes later, in what could have been a turning point of the game, Edwards stopped a Shelburne breakaway, giving VanGaver the opportunity to give the Wolves a lead they wouldn’t relinquish, on a powerplay, late in the second. Assists went to Nick Locking and McQuillin. In the third it was all Wolves, as they pumped four goals past the Shelburne goalie. VanGaver had his second of the night from Tyler deVos and Locking, and deVos followed it up by picking the top corner on a a shorthanded breakaway three minutes later, unassisted. Locking then scored on the powerplay from VanGaver and McQuillin, and Mark Stanley finished the evening’s scoring, from Darrin MacDonald and Wreford. The win clinches home ice advantage for the Wolves in the first round, but playoff seeding won’t be decided until the end of tonight’s action. The Wolves currently sit in fourth, one point behind Shelburne and two behind Saugeen Shores. The Wolves can finish as high as second, but no lower than fourth, as they hold the tie-break with Saugeen Shores. Shelburne faces Lucknow this evening and, barring an eyebrow-raising collapse, should leap-frog Port Elgin in the standings tonight. The good volunteers of the Saugeen Shores Winterhawks are very active on Twitter (@SSwinterhawks), and we’ll do our best to bring you updates via Twitter (@RipleyWolves) and Facebook, and visit ripleywolves.com tomorrow for the story and a breakdown of playoff seedings. We’d also like to thank our friends in the local media – Jordan MacKinnon at CKNX Radio, Liz Dadson at kincardinetimes.com, John Adams at The Kincardine News, and Josh Howald at the Kincardine Independent – for their coverage of this event, as well as the entire season.